What is your specialty? 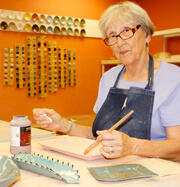 Functional pottery— paintings and hand made bead necklaces. “I have always been involved in arts and crafts, and it was a great joy to discover our Artisan Complex many years ago, a discovery that led me back to oil painting, watercolor, pencil drawing, and then to our clay studio. My love of hand-built pottery has just expanded over the years. I find it personally fulfilling to be creating new pieces of pottery and to have our wonderful gift shop to display and sell our creations.